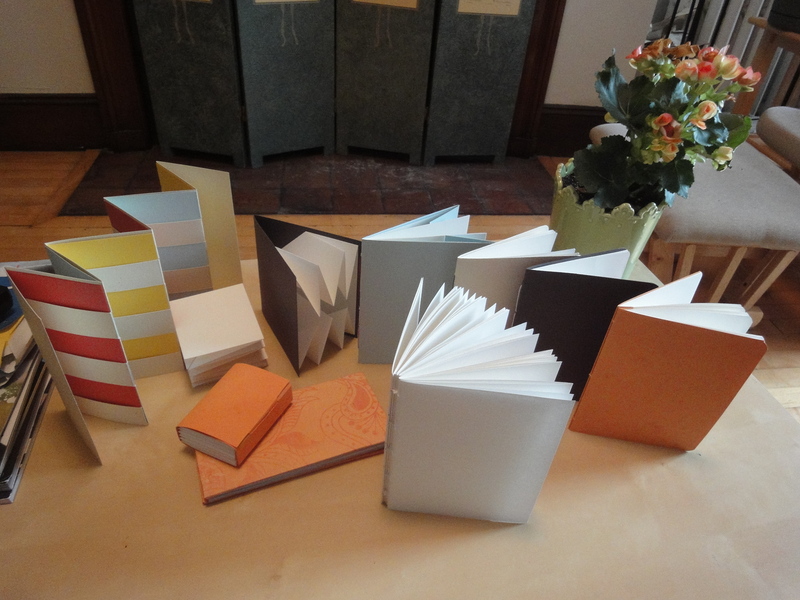 On Saturday, I took a Bookmaking for Beginners workshop taught by Sarah Smith through GSLIS Continuing Education. 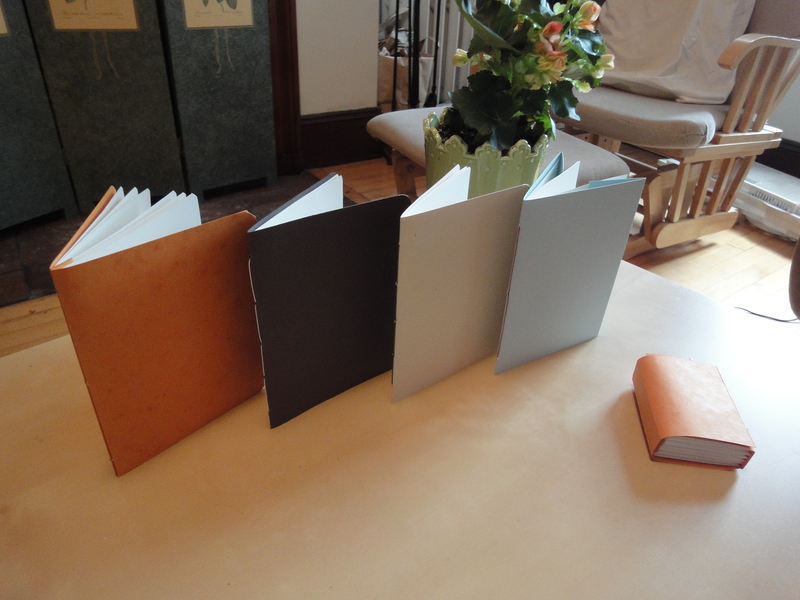 The workshop began with a short lecture about different kinds of bindings through history, and how contemporary artists are re-using and making books. The rest of the day was all hands-on: we started with the one-sheet fold-up and the accordion structure, then the blossom fold, Turkish map fold, and Korean map fold; then we learned how to make single-section and two-section pamphlets, and finally how to do chain-stitch. All the books! 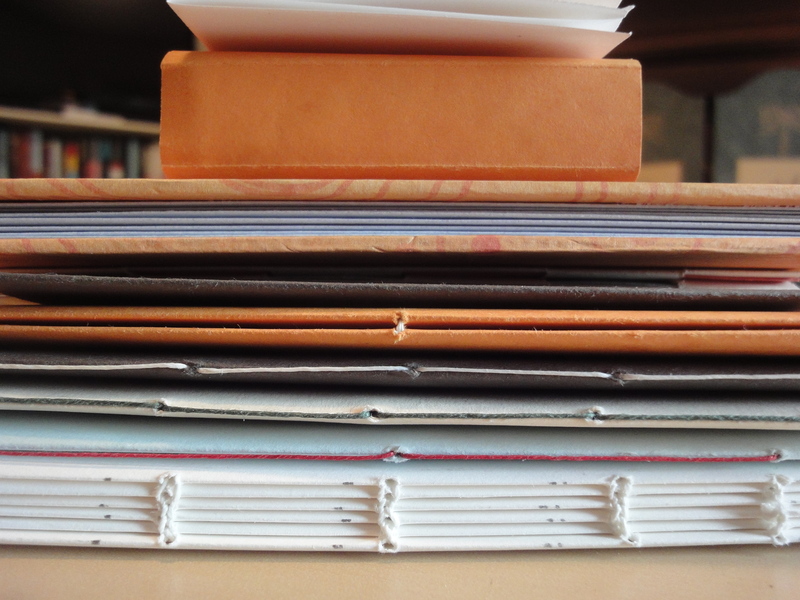 From top to bottom: Blossom fold, Korean map fold, accordion fold (with covers), woven flexagon, Turkish map fold, two-section pamphlet, one-section pamphlets, chain-stitched binding. From left to right: two-section pamphlet, one-section pamphlets (3- and 5-station), and Korean map fold. 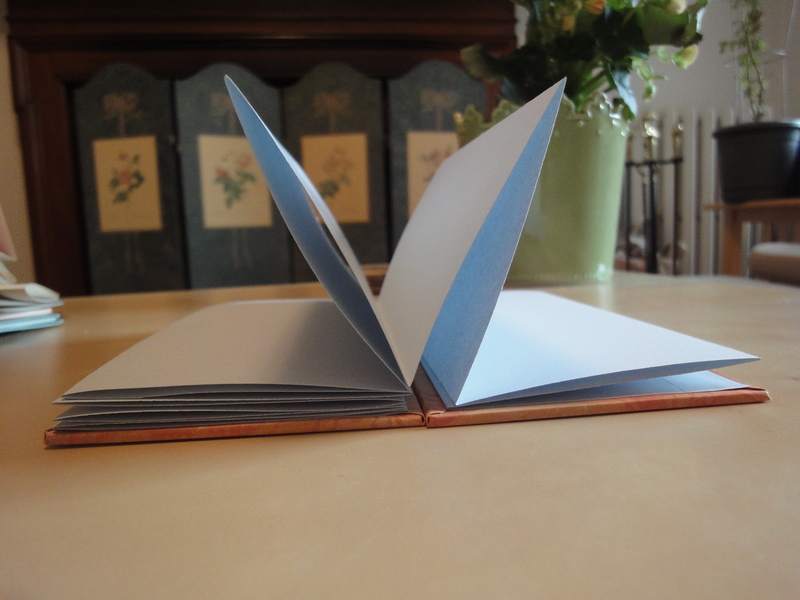 This is the Korean map fold book: it’s the same one that looks like a little cedar block in the previous picture. 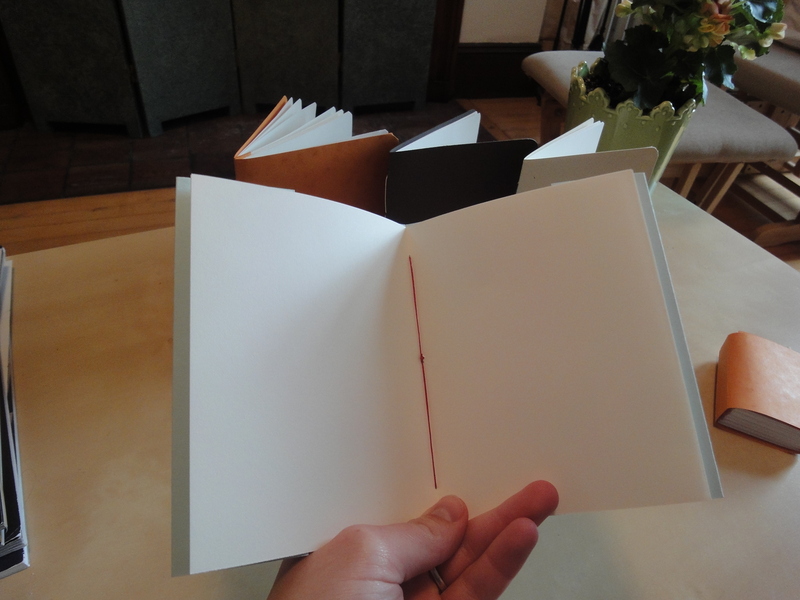 It’s bulky because it contains six pieces of 8.5″x11″ paper, folded into 8 sections each. 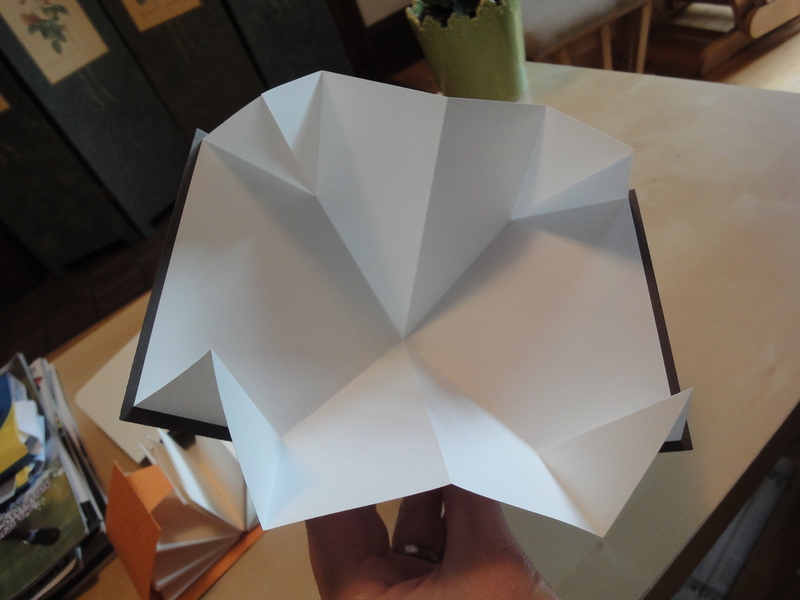 This is the two-section pamphlet; the sections are each made up of four sheets of paper, each folded in half once. The cover has a pleat in the middle, and there are three “stations” (holes) where the waxed thread goes through all the layers to hold it together. This is a one-section pamphlet, also with three stations. I gave the other pamphlets rounded corners, but I folded the edges of this cover in, so it has French flaps (like fancy trade paperback editions sometimes do). All four pamplets: the top two have five stations, the bottom two have three. Standing up like this, these remind me of The Monster Book of Monsters from Harry Potter (when Hagrid teaches the Care of Magical Creatures). 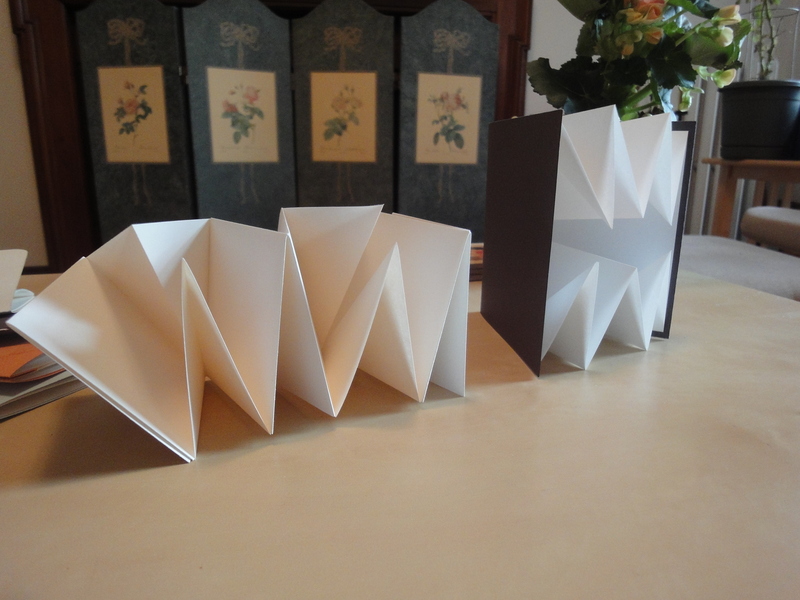 On the left is the blossom fold; on the right, the Turkish map fold. Here’s the Turkish map fold, open. It does fold down nice and flat – I think I have a city map of Paris folded in a similar way. This has the best name of all: woven flexagon. We started with one long sheet (the cream-colored paper), and used a blade to make slices about 1″ apart; then, we took the colored papers and wove them between the slices. It’s quite cheerful-looking, but I have no idea what I’ll do with it. 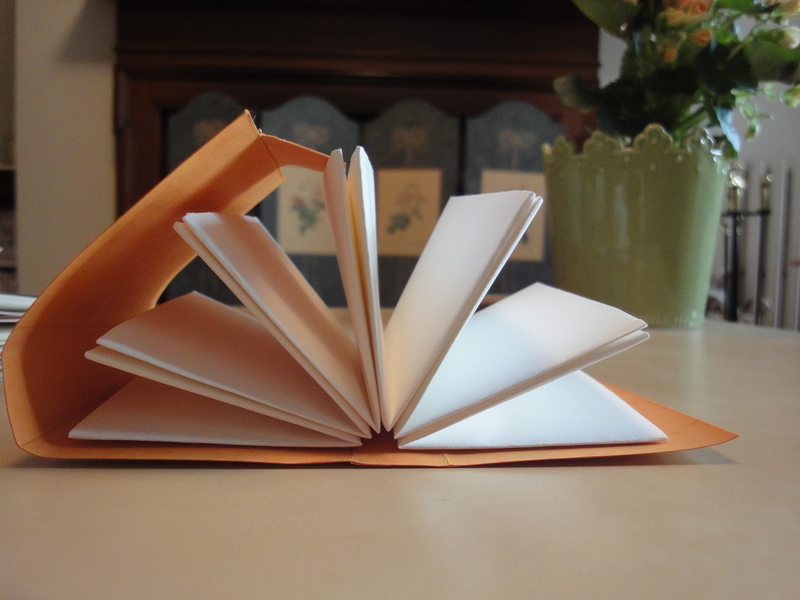 A simple accordion fold, with covers made of binder’s board covered with decorative paper. 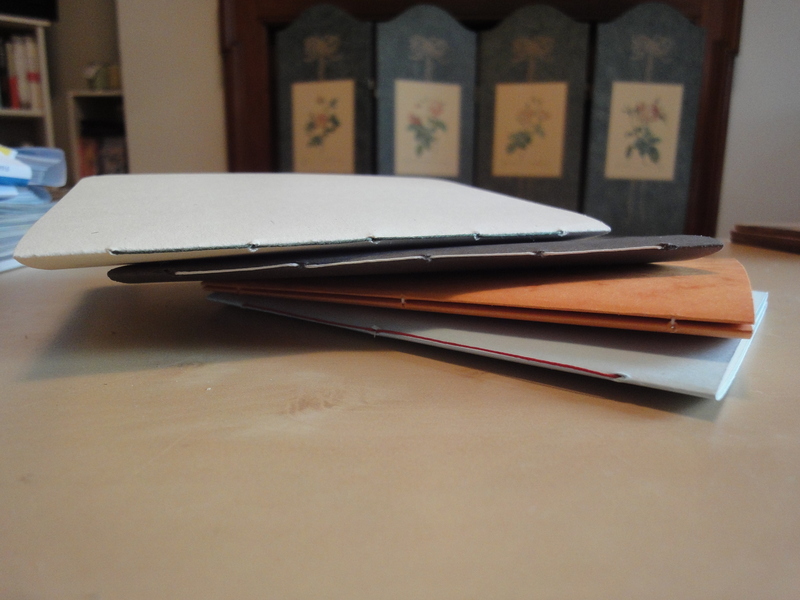 We got to use polyvinyl acetate (PVA), an archival-safe plastic adhesive, to glue the paper cover over the board. Sarah showed us how to tuck the corners in with a bone folder to make them smooth and sharp. 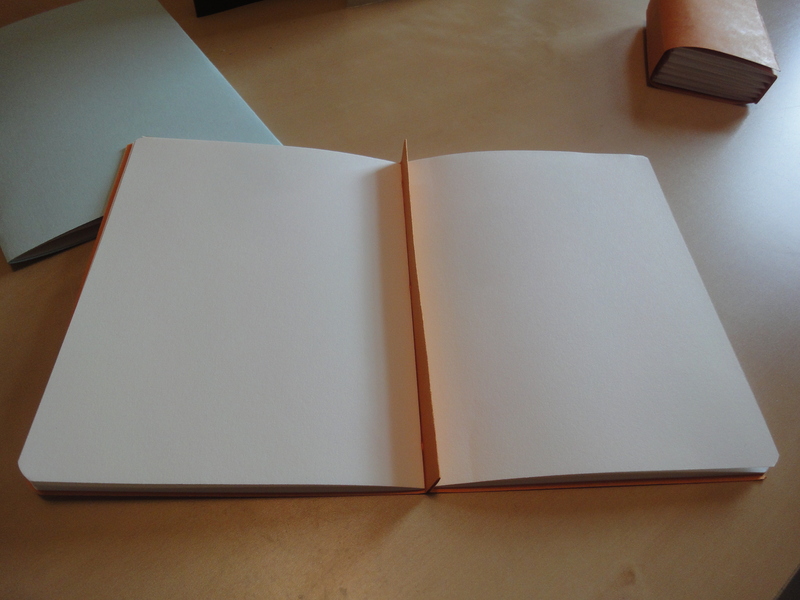 The same book, lying open. I preferred the sewing to the folding; I couldn’t make the folds 100% exact. 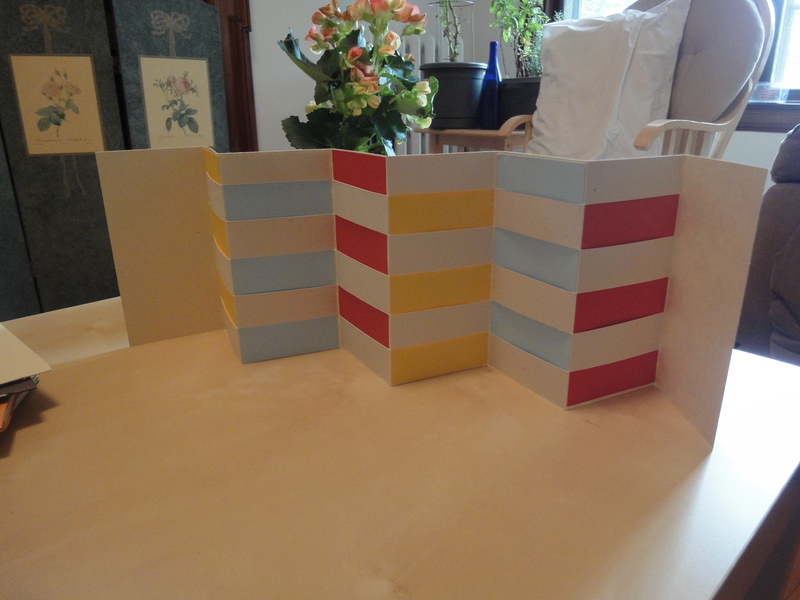 Sarah also showed us how to make an accordion fold with pockets, which I would have liked to cover with the binder’s board, but mine didn’t quite stack straight. 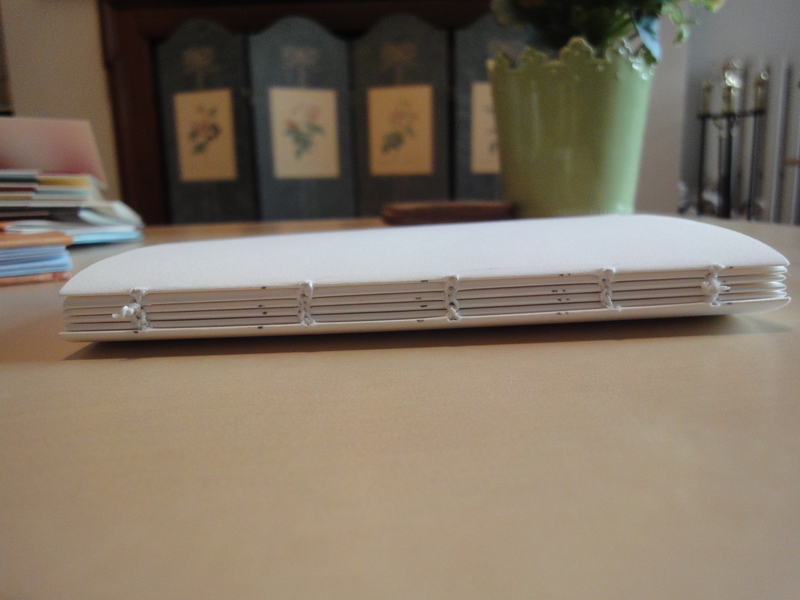 Finally, the chain stitch – this is the longest book, with five sections, or signatures, sewn together. 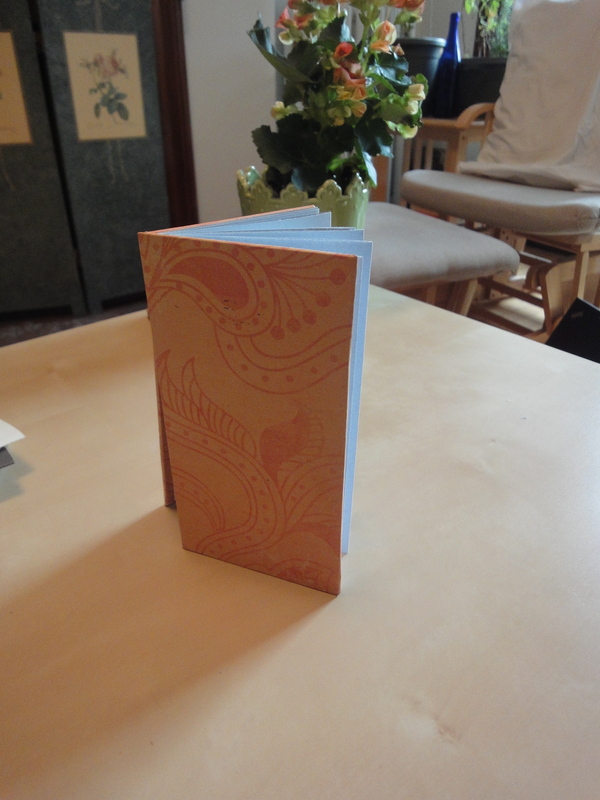 Here’s the chain-stitched booklet, closed. The stitching makes a nice pattern. 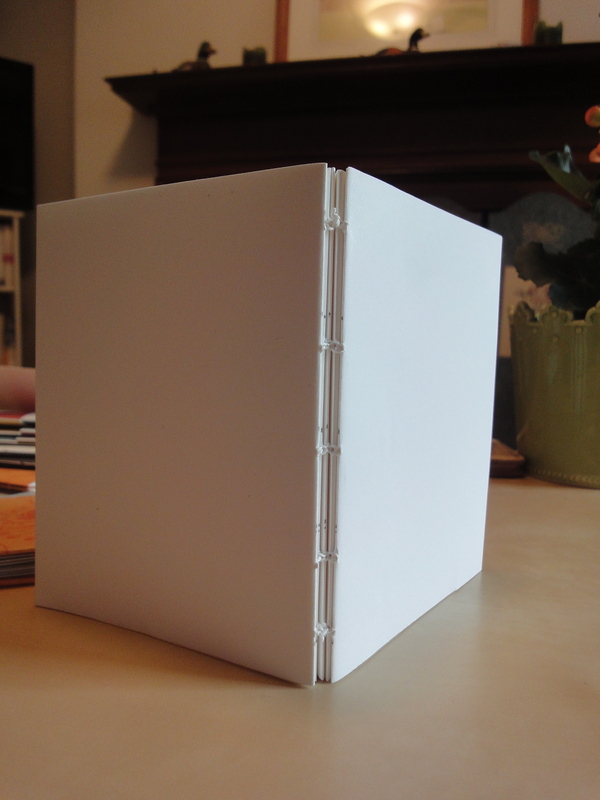 Other than being pretty, the chain stitch is also a nice binding because it allows the book to open flat, which is good for journals and sketchbooks, because you can write or draw deeper into the margins without worrying about the gutter. 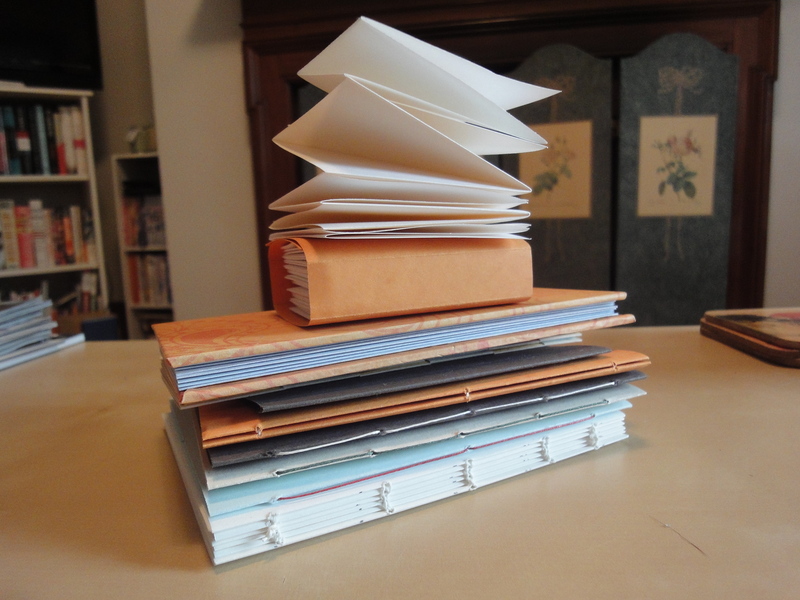 A flock of books – all hand-made in less than seven hours. 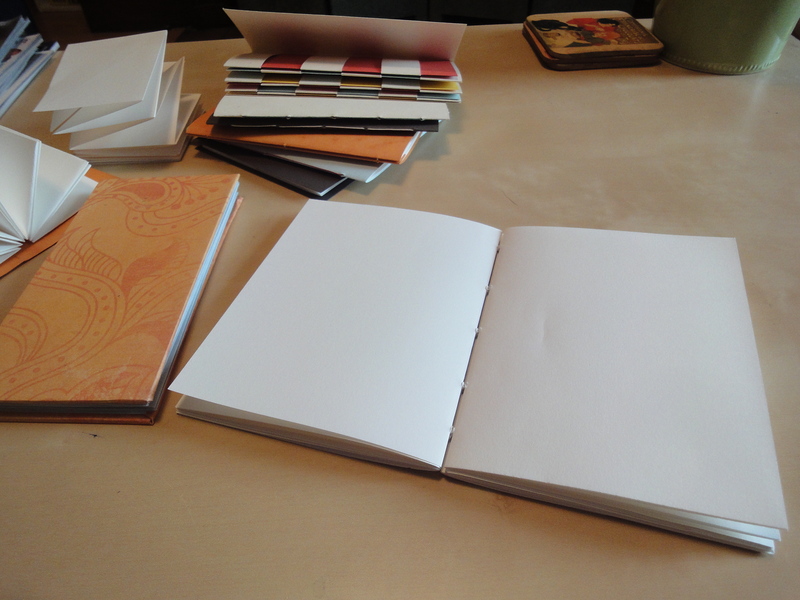 Even though I probably won’t be using these bookmaking skills in a practical setting anytime soon, the workshop was a good experience: I learned new things, stretched the part of my brain that relates to making tactile things, and created a physical product to use or give as gifts. All in all, a Saturday well spent. Like it or not, grammar matters. 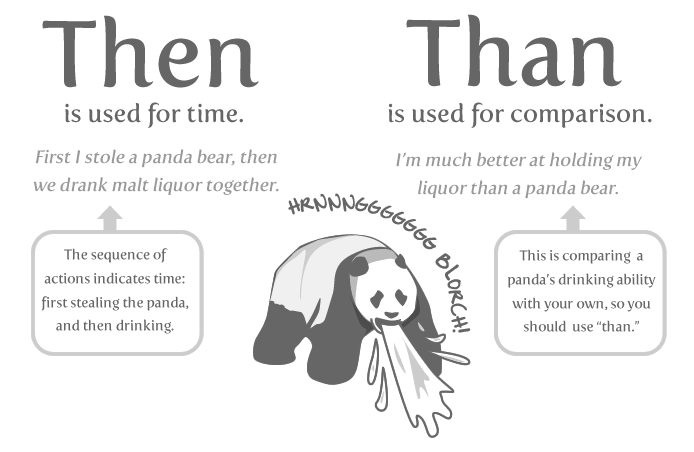 I try to be non-judgmental and open-minded about a lot of things, but I absolutely judge based on grammar and spelling, and these resources allow me to admit that and justify it a little bit. In the grand scheme of things, is grammar important? Well, as the first article says, yes: potential employers and hiring committees are going to judge also. Should it be important is another question, but for now, it is. Everyone who has to write a cover letter or put together a resume is probably going to be judged on their grammar. Written communication is important – as is attention to detail, especially if you’re applying for a job. So if you’re in category (a), take advantage of the opportunity to learn from comics. For those interested in the Digital Public Library of America (DPLA) project, Simmons GSLIS will be streaming the plenary meeting, which is taking place this Friday, October 21, in Washington, D.C. Here’s the agenda: there are a number of amazing speakers, including David Ferriero (Archivist of the United States) and John Palfrey, chair of the DPLA steering committee and author of Born Digital. Maureen Sullivan (ALA President 2012-13) and Robert Darnton of Harvard University Libraries (and author of The Case for Books) will serve as moderators at different times of day. The Beta Sprint projects will be presented at 1:30pm. This is a project I’m interested in and have been following for some time. I’m sorry I can’t be in D.C. on Friday, but looking forward to seeing what they have come up with. A “national digital library” is such a huge project, it’s hard to wrap your mind around – but if Europe can do it, maybe the U.S. can pull it off as well. That’s a quote from a recent New York Times article about Amazon edging out publishers and dealing directly with authors. I can’t tell if it was quoted faithfully or taken out of context, but if it is a true statement of expression, I have to disagree. Even the best writers – however you define best – need editors. Not every author-editor relationship is a life-changing or earth-shattering one, but editing does improve books: editors might pose the right question at the right time, or suggest cutting an element that doesn’t move the story forward, or suggest a new angle. Writers can become so immersed in their own work they are unable to look at it clearly and objectively; here, too, an editor is helpful. This is not to say that bad books don’t get published, even with an editor (define “bad” however you want – it’s out there). And it’s not to say that it’s completely impossible for an author to write and publish a work of quality without an editor – but that’s the exception, not the rule. After all, there are dozens of authors writing today who are top-notch, “experts” at what they do; those authors are still working with editors. Even Amazon is employing editors (though nameless executives won’t say how many). The publishing industry gets a lot of flack. It’s not Wall Street; no one I met while I was working in publishing was in it for the money. It’s not innocent, either (come on, HarperCollins, 26? ), but it does have a function, and it is a valuable part of the process by which an author produces a book and that book becomes commercially available. Amazon represents a legitimate threat to traditional publishers, but this is not the end of the world, let alone the industry. Radio wasn’t the end of books, TV wasn’t the end of books, and the Internet isn’t the end of books. If anything, the Internet proves how badly editors are needed. We aren’t “there” yet, but it’s exciting to see the progress being made with libraries and e-books.